The tracking of a psychological language of the nation back in time could lead us at least as far back as the eighteenth century, to the ideas of Hume and Herder, or the early nineteenth-century writings of de Staël, Fichte, and Hegel. 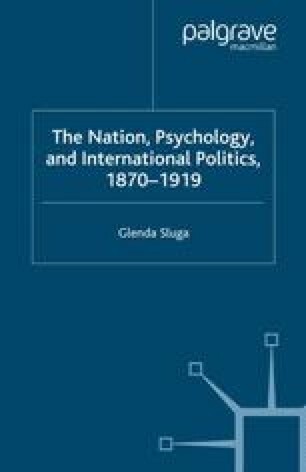 But in the latter half of the nineteenth century, the weight of evolutionary and racial thought imposed a quite specific political burden on the idea that the nation was a psychological form and that national differences were the products of psychological processes and characteristics. Intellectuals who tackled the nation question in the latter half of the nineteenth century wrote in the midst of distinctive debates about the biological and historical origins of human psychology and human differences.1 The rise of psychology ‘as a coherent and individuated scientific discourse’, conventionally dated to the 1870s, signalled the emergence of an authoritative discourse of psychology that embraced to varying degrees racial and evolutionary thought, and that was regarded as specifically relevant for explaining the processes of nation-formation.2 This new scientific understanding of psychology emphasised the compounded influence of racial and historically accumulating cultural characteristics on nations, on their psychological features, and on their political destinies. It also fortified the view that the answer to what contemporaries referred to as the ‘nation question’ lay in psychology.